When shopping for a tank for Finley, one clerk at a pet store said it’d be better to get a smaller tank that came with several backgrounds that could be swapped out for enrichment, rather than a larger tank with no background. I opted for the larger tank and resolved to make my own backgrounds. That plan evolved into giving Finley a magazine page every day – sometimes several times per day. He LOVES them! I even started to learn what types of pictures he likes best (animal pics and pictures of cities, particularly city lights). After I saw how much he liked pictures, I started showing him everything I could find – brochures, pizza flyers, my own photos, greeting cards, postcards – even cracker boxes. Anything I thought he might like. Wherever I went, I kept a look out for any free paperwork I could take home to Finley. Finley also likes watching TV and movies with me. 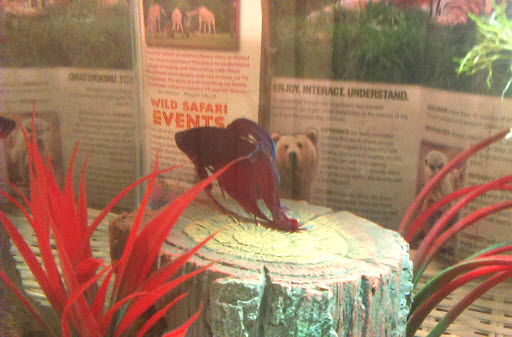 He would swim over and settle down on his rock cluster, which is the closest cozy spot to the screen. Eventually, I started giving him his own TV time – usually either on my tablet or cell phone. Needless to say, he particularly loves Finding Nemo. Of course I make sure to stay away from any shows that have rated-R fish content like Deadliest Catch. I thought cartoons would be his favorite because of the bright colors, but he seems to like watching regular TV (humans) just as much. Once we started doing that though, I really had to step it up with his art. So I started making an ‘Art Garden’ outside his tank with anything colorful and oddly shaped. He’s become very possessive of his Art Garden and I get flared at sometimes when I try to move things around to make it new and interesting. Now I keep an eye out for any colorful little things that I can add like bottle caps, pen caps, or cat toys. 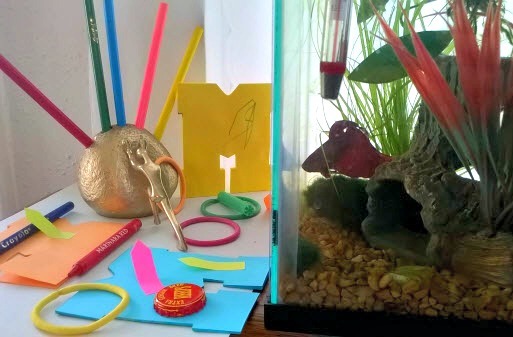 Hair ties have always been one of Finley’s favorite things – check out the post Betta Fish Fun: Hair ties! to see a video of him playing ‘fetch’ with them!